If you are visiting our bed and breakfast accommodation with children between Thursday 18th October and Sunday 18th November 2018 then you may like to visit Sunderland Illuminations aka Roker Park Lights a few miles south of us in Roker, Sunderland. Sunderland Illuminations 2018 will feature lights from St Peters Church along Roker seafront. An illuminated observation wheel will be present on Cliffe Park along with fairground rides and catering concessions. Roker Park will be transformed into a Festival of Light. Roker Park will be open Thursday to Sunday each week, plus every night during October half term. Tickets to the Festival of Light cost £2 per person (children aged two and under go free but still require a ticket) and can be booked online. For groups there is a £1 discount if you buy five or more tickets. 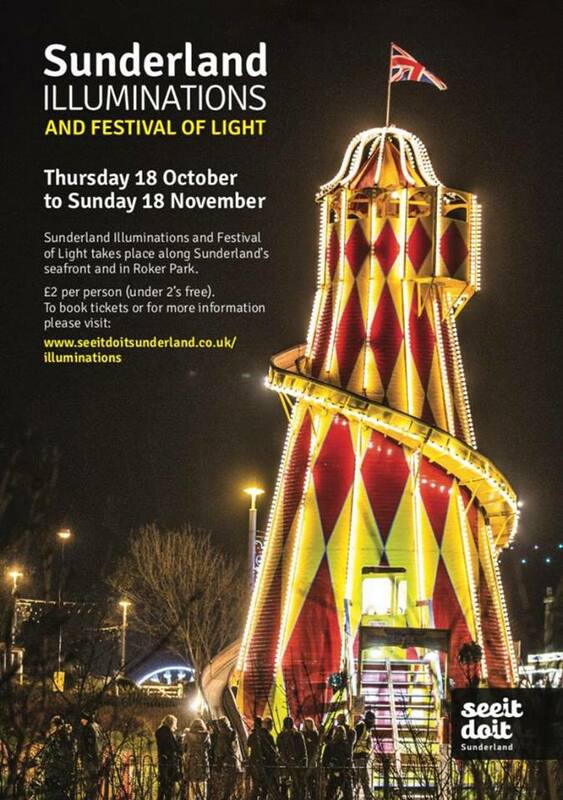 E-tickets or printed tickets will be accepted to gain entry to Roker Park Festival of Light. There will be no ticket sales on the entrance gates of Roker Park. You can buy tickets online here (opens in a new window). Sunderland‘s 10K and half marathon take place this Sunday. If you are staying at our bed and breakfast accommodation and taking part or plan on visiting Sunderland on Sunday we have the race route and information here to help plan your day. The start and finish of the 10K is at Keel Square opposite the old Vaux site. 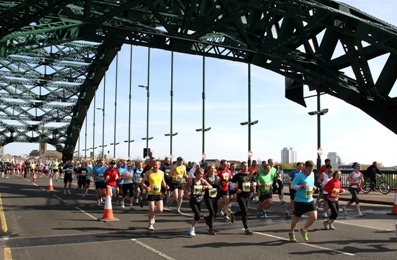 The first part of the race is a 2K loop around the city centre before reaching Monkwearmouth Bridge. Next runners pass the University of Sunderland campus hosts the runners along the river, passing the National Glass Centre before gently rising up the path to then drop down again toward Sunderland Marina. Sunderland Marina is also the location of the half way point of the 10K route. Runners then follow a path along Roker seafront. A left turn through the Dene leads into Roker Park. Roker Park’s bandstand is the 6K mark. 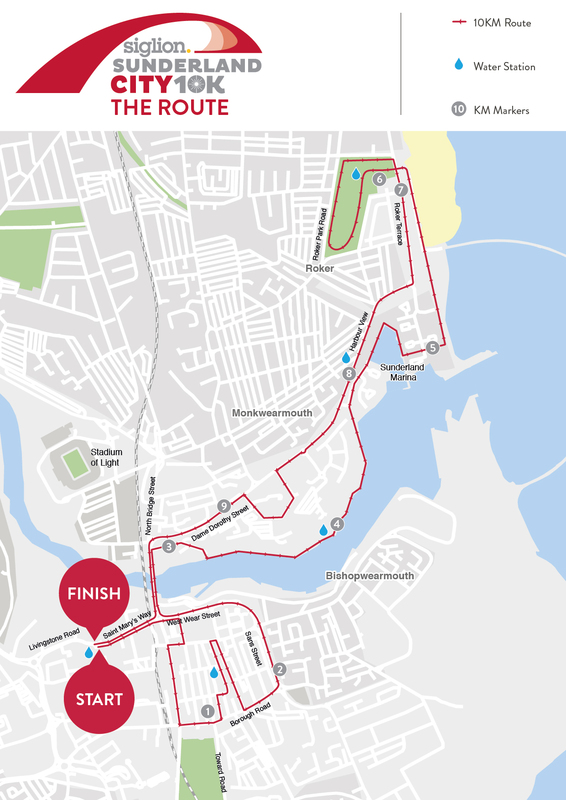 The race route then loops back onto Roker Terrace before a flat 2K run back to Monkwearmouth Bridge. Finally a right turn at St Mary’s Way leads to the finish line at Keel Square. You can see a map of the 10K route below. Tip: click on the map for a larger image (opens in a new window). The Sunderland City Half Marathon and start and finish is at Keel Square opposite the old Vaux site. 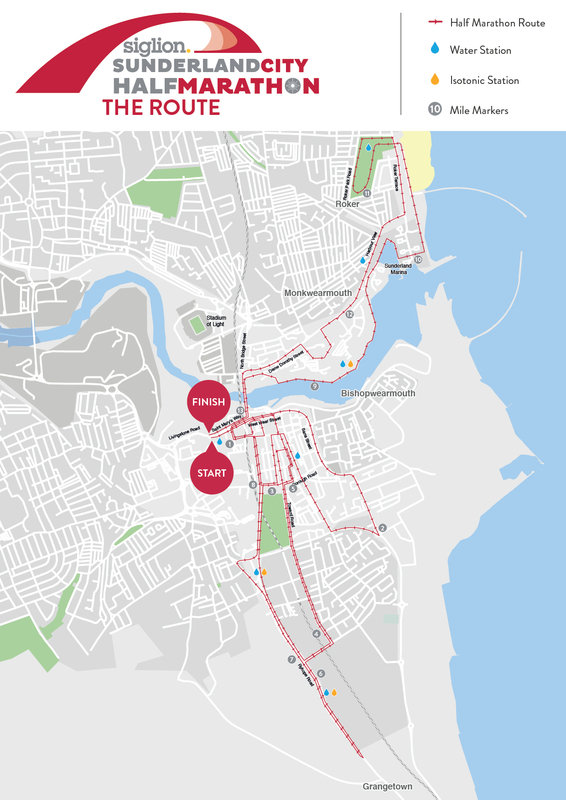 The first mile of the half marathon passes through the Sunniside area of the city centre. A left turn at approximately 3.5 miles takes the course down Toward Road past Mowbray Park and back to the city centre area before heading back towards Ryhope Road. The turnaround point is just before the Queen Alexandra pub roundabout. The halfway point is on the return stretch of Ryhope Road before it reaches Backhouse Park. Next runners travel along Burdon Road back to Monkwearmouth Bridge. At Monkwearmouth Bridge there is approximately 4.5 miles left to the finish. Runners then travel along Dame Dorothy Street, circumnavigating St Peter’s Church before heading to the coast and following the sea front along Roker Terrace. Upon entering Roker Park there are only 2.6 miles left to complete and the route returns to cross Monkwearmouth Bridge via Dame Dorothy Street. With the finish line at St Mary’s Way. You can see a map of the half marathon route below. Tip: click on the map for a larger image (opens in a new window). The next Sunderland restaurant week takes place from Saturday 17th March until Sunday 25th March 2018. 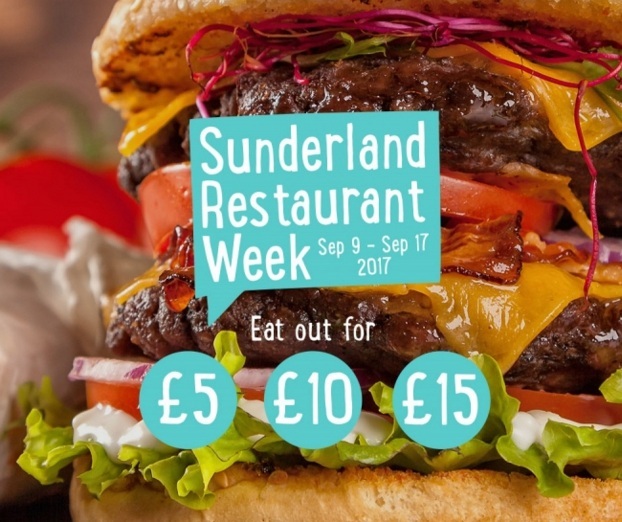 Restaurants from across Sunderland will be showcasing their unique flavours, offering special two and three course menus for £10 or £15 as part of Sunderland Restaurant Week. Daytime cafés are offering special £5 deals. Angelo’s Ristorante, 48 West Sunniside, Sunderland, SR1 1BA. With an award-winning Italian chef under its belt, whipping up meals that could make all of Italy jealous, there is no wonder this Sunniside joint has been voted one of the top 10 Italian restaurants in England. Arabesque, 144 High Street West, Sunderland, SR1 1UN. Enjoy a true taste and feel of Egypt at the North East’s first authentic Egyptian restaurant, complete with furnishings and decor imported from the land of the pharaohs itself. Sunderland Restaurant Week offer: two courses for £10; three courses for £15. Asiana Fusion, Unit 2, Echo 24 Building, West Wear Street, Sunderland, SR1 1XD. With a jam-packed menu of palate-pleasers and an unrivalled view of the Wearmouth Bridge and Sunderland docks, this well-situated pan Asian restaurant explores the flavours of Indonesia, Thailand, Vietnam, Malaysia and China. Sunderland Restaurant Week offer: three courses for £15. Biscops @ The Minster, The Minster, High Street West, Sunderland, SR1 3ET. With a selection of English dishes, including panackelty and pies, this small café brasserie at the Minster is a great find in a unique, local setting. Sunderland Restaurant Week offer: main course, soup or a dessert and small soft drink for £5. Bonded Warehouse, Fish Quay, Low Street, Sunderland, SR1 2RQ. Introducing a completely unique destination venue, bringing live music, tank beer & great food to Sunderland’s city centre. Sunderland Restaurant Week offer: two small plates and beer or wine or soft drink for £10. Café Farah, 103-105 High Street West, Sunderland, SR1. An Italian style cafe bar with a modern twist – offering a menu with something for everyone. Sunderland Restaurant Week offer: three course meal for £9.90 (5pm – 7pm); two course meal for £9.90. Carter & Fitch, Washington, NE37 1PH. An exciting new bar and restaurant serving some of the finest food and drinks around. Casa Italia, 15-16 Green Terrace, Sunderland, SR1 3PZ. Sunderland Restaurant Week offer: two course meal for £9.99 (4pm – 7pm excluding Saturday). Chaplins, 40 Stockton Road, Sunderland, SR1 3NR. A historic town centre local pub offering a warm welcome to all. Fresh home made food and real ales. Sunderland Restaurant Week offer: any main meal and dessert for £5. City Bistro, Sunderland College – City Campus, Park Lane, Sunderland, SR1. Providing a showcase for the next generation of chefs, the training restaurant based at Sunderland College’s City Campus serves up quality, creative cuisine, at a price few can match. Sunderland Restaurant Week offer: lunchtime – three courses for £10; evening – three courses for £15, including glass of wine. El Nido Mexicana, 46A Frederick Street, Sunderland, SR1 1NF. Tucked away on Frederick Street, give your taste buds a feisty kick with El Nido’s great range of homemade tacos, burritos or maybe a cocktail. Sunderland Restaurant Week offer: starter, burrito or two tacos for £10. Add a dessert and side for £15. Add a cocktail for ££15. Enchantment Cafe, 18 Olive Street, Sunderland, SR1 3PE. Step into a fairytale dream and enjoy handmade food and cakes alongside great coffee. Sunderland Restaurant Week offer: any two hot drinks and two cakes for £5. EFES, 3 Derwent Street, Sunderland, SR1 3NT. Drawing from their heritage and named after the popular Turkish tipple, EFES is a melting pot of cultures, fusing flavours from the Med, the Middle East and more. With meats cooked traditionally over wood charcoal, slabs of halloumi and falafel aplenty, this Turkish joint is a sure treat for the taste buds. Sunderland Restaurant Week offer: two starters and a main course for £10. Fat Buddha, Whitburn Road, Seaburn, Sunderland, SR6 8AA. Located in Seaburn, Sunderland’s lovely seaside resort, Fat Buddha Asian Bar & Kitchen offer something refreshingly different. Whether sitting enjoying the sunshine on their balcony or through their large windows, viewing the crowds on the beach through the spring & summer, or watching a storm tossed sea from the warm comfort of the Buddha – the view is always interesting, and their award winning food, cocktails and range of Asian beers are available all day every day. Sunderland Restaurant Week offer: two courses for £10 4pm until 7pm; two courses for £15 7pm until close. Fat Hippo, Fish Quay, Low Street, Sunderland, SR1 2RQ. Local favourite Fat Hippo takeover the kitchen at Bonded Warehouse Sunderland every Wednesday with their bangin’ burgers. They specialise in the good kind of gluttony, making indulgent burgers that leave your fingers messy and your belly full. Sunderland Restaurant Week offer: two courses for £10. Fiume, Bonemill Lane, Harraton, Washington, NE38 8AJ. Mouth-watering Italian food and outstanding customer service provided over 15 years. Sunderland Restaurant Week offer: three courses for £10. Gatsby, 13-14 Derwent Street, Sunderland, SR1 3NT. Situated on Park Lane, enjoy good food and drinks in comfort. Sunderland Restaurant Week offer: £5 meal deal. Grannie Annie’s Pub & Pantry, Marine Walk, Roker, Sunderland, SR6 0PL. Breakfasts, sandwiches, home comforts, sizzlers and a selection of grilled favourites – all at Grannie Annie’s. Sunderland Restaurant Week offer: two courses for £10; three courses for £12.95. Grosvenor Casino, 6 Lambton Street, Sunderland, SR1 1TP. This hidden treasure inside Grosvenor Casino serves up everything from salmon to steaks with a pocket-friendly price tag. And with the Eat Sunderland Restaurant Week, the prices are just getting lower. Sunderland Restaurant Week offer: buy one restaurant meal get another one half price. Holmeside Coffee, 27-28 Holmeside, Sunderland, SR1 3JE. Located underneath Sunderland’s most popular music venue, Holmeside Coffee has been serving up fine cups of coffee (and cake) since 2013. More recently, it has introduced a range of tempting breakfasts and lunches, which in the past have included sky-high pastrami sandwiches and salmon and cream cheese bagels. Sunderland Restaurant Week offer: sourdough pancakes & any hot or cold drink for £5. Hotel Chocolat, The Bridges Shopping Centre, Sunderland, SR1 3LE. British cocoa grower, chocolatier, hotelier and restaurateur, now open in The Bridges Shopping Centre in Sunderland. Sunderland Restaurant Week offer: £5 daytime offer – brownie and hot chocolat drink. Italian Farmhouse Sunderland, Best Western, Roker Terrace, Sunderland, SR6 9ND. Italian Farmhouse Sunderland’s menu takes top quality Italian ingredients together with the finest locally-sourced meat, fish and vegetable for an unrivalled dining experience. Their pizzas are made from scratch on-site and baked in our spectacular wood fired pizza oven for a truly authentic taste. Karbon Grill, Hilton Garden Inn, Vaux Brewery Way, Sunderland, SR5 1SN. Karbon Grill is a Pan American restaurant where food is cooked on a Josper Grill, using the North East’s proud industrial heritage to inspire its name. Sunderland Restaurant Week offer: coffee and Cake for £5; two courses for £10; three courses for £15. Kings Tapas Lounge, 1 Olive Street, Sunderland, SR1. Offers different types of Indian tapas, pizza, grills, proseccos, cocktail and whisky, gin and vodka. Sunderland Restaurant Week offer: any four tapas for £9.95 per person; two for one prosecco, cocktails, gin, wine or any bottles of lager or cider for £10. Let There Be Crumbs, Best Western Roker Hotel, Roker Terrace, Sunderland, SR6 9ND. A relaxing stop-off from a coastal wander, a place for catch-ups, an eatery to enjoy light bites or a spot to sit and watch the world go by with a good brew and a guilty pleasure. Sunderland Restaurant Week offer: tea or coffee and a sandwich for £5. Liberty Brown, 10 Hylton Retail Park, Sunderland, SR5 3XG. Liberty Brown offer fabulous food, cracking cocktails, amazing atmosphere and a menu boasting freshly cooked & local produce – there’s something fror everyone. Sunderland Marriott Hotel, Queens Parade, Sunderland, SR6 8DB. Visit the Seaburn Bar & Grill for delicious dining and breathtaking views of the Sunderland seafront. They offer a light bar menu and afternoon tea as well. The conservatory at the front of the restaurant is excellent for breakfast. Sunderland Restaurant Week offer: cake with tea or coffee for £5; main course and a pint or 75ml house wine for £10; two main courses for £15. No 2 Church Lane, 2 Church Lane, Sunderland, SR1 3ET. Simple and straight to the point, No 2 Church Lane is all about beers and burgers. However, you would be fooled to think that its menus are limited, as it has an extensive list of meat, vegetarian and vegan burgers to choose from, as well as more than 70 beers. Port Of Call, 1-3 Park Lane, Sunderland, SR1 3NX. Delve into Sunderland’s shipbuilding past at this modern Park Lane venue, with three floors serving up a selection of real ales, cocktails and hearty meals complete with delicious home-cooked chips. Revolution, Victoria Building, 1-6 Low Row, Sunderland, SR1 3QD. Situated a hop, skip and jump away from the Sunderland Empire and the Bridges, Revolution is a great place to meet friends for a catch-up over quality cocktails and tasty fodder. Plus, if the sun is out, there is a lovely roof terrace upstairs. Sunderland Restaurant Week offer: two courses and a soft drink for £10; upgrade to three courses for £12.95. River Bar, Bonemill Lane, Fatfield, Washington, NE38 8AJ. River Bar is one of Washington’s best kept secrets that everyone knows about. Sunderland Restaurant Week offer: All hash dishes for £5. Royale Thai, 9 Mary Street, Sunderland, SR1. Just two minutes away from Park Lane, this traditional Thai restaurant at Mary Street is a welcome addition to Sunderland’s restaurant scene. With exotic dishes and inviting staff, it is a brilliant place to pop for lunch, dinner or even just drinks. Santorini, 18A John Street, Sunderland, SR1. Santorini brings the authentic taste of Greece, right to the heart of Sunderland city centre with a selection of meze, souvlaki and special themed evenings. Thai Bay, 34 West Sunniside, Sunderland, SR2 1BU. Take your taste buds on a journey to the Far East with Thai Bay’s exotic dishes, with quirky names such as Drunken Duck and The Original Saucy Dirty Cow. Sunderland Restaurant Week offer: lunch – two course platter with a soft drink for £9.99; evening – two courses (any starter and main) for £15. The Cooper Rose, 2-4 Albion Place, Sunderland, SR1 3NG. Serving up good old pub grub that won’t break the bank, The Cooper Rose is ideal for popping in for a light lunch while out shopping, or a hearty breakfast the morning after the night before. Sunderland Restaurant Week offer: any gourmet burger, club drink and dessert for £10. Club drinks include a selected range of lagers, ciders, spirits, wine, soft drinks and hot drinks. The Engine Room, High Street West, Sunderland, SR1. The Engine Room at the Fire Station on High Street West, add some heat to your meal with great food in even better surroundings. The Funky Indian, Mowbray Park Centre, 39 Borough Road, Sunderland, SR1. Tuck in to aromatic dishes while surrounded by authentic Indian décor at Sunderland’s first Indian tapas restaurant. Plus, if you are making it a late one, The Prosecco Bar is upstairs. The Ivy House, Worcester Terrace, Sunderland, SR2 7AW. The Ivy House don’t have a microwave. Not one. They don’t do frozen. They cook from scratch. Their own dough. Their own buns. Their pizzas and burgers are as fresh as it gets and all made right in front of you. Come in and see for yourself. Sunderland Restaurant Week offer: any half pizza or sandwich served with salad, triple cooked wedges & soft drink for £5. The Lambton Worm, Low Row, Sunderland, SR1 3PY. Great food and drinks at the newly refurbished, popular city centre joint. The Meat Up, 1st Floor, 15-17 Derwent Street, Sunderland, SR1 3NU. Passion, experience & creativity combine to create The Meat Up a perfect urban bar/grill experience serving high quality, feel good food complimented by iconic drinks and cocktails sourced from around the world. Sunderland Restaurant Week offer: any starter, burger or parmo and a dessert (assorted cakes with ice cream or cream) for £15. The Peacock, 287 High Street West, Sunderland, SR1 3ES. Stunning family-friendly pub & cultural venue serves stunning food, a fantastic range of ales, spirits, wine and live entertainment. The Saltgrass, Ayres Quay, Hanover Place, Sunderland, SR1. Newly restored, The Saltgrass is back and ready for business serving good quality pub grub to Sunderland. Victorian Eve’s, 23 Fawcett Street, Sunderland, SR1. Tucked aside on the historic Fawcett Street, take a step back in time with Victorian Eve’s. Enjoy fresh cakes, bakes and afternoon tea in this charming cakery and tearooms. Sunderland Restaurant Week offer: £5 daily special; £10 any hot lunch with dessert and pot of tea; £15 Afternoon tea for two. The William Jameson, 30-32 Fawcett Street, Sunderland, SR1 1RU. Directly across from Sunderland’s Winter Gardens, The William Jameson pub is just one of the city’s Wetherspoon venues and has a whole host of regulars, real ales and bargain bites. Click for more Events on our blog. 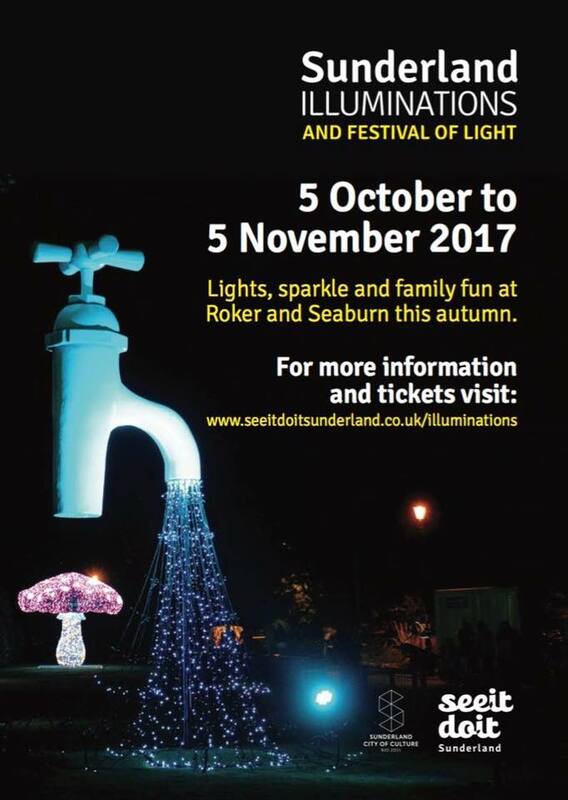 If you are visiting our bed and breakfast accommodation with children between Thursday 5th October and Sunday 5th November 2017 then you may like to visit Sunderland Illuminations aka Roker Park Lights a few miles south of us in Roker, Sunderland. Sunderland Illuminations are to return for 2017, with lights spreading sparkle from St Peters Church all along the newly regenerated seafront. As well as feature lighting right along the seafront, the popular illuminated observation wheel will return to Cliffe Park and traditional fairground rides and quality catering concessions will run from Cliffe Park to Bede’s Cross. Seafront lights and activities on Cliffe Park and Bede’s Cross will run from from Thursday 5th October until Sunday 5th November from 5-10pm each day. Roker Park will be transformed into a Festival of Light, with a Disney theme. The Park will be open every Thursday, Friday, Saturday and Sunday from 5th October to 5th November plus every night at half term, from 5pm until 10pm each night. Last entry into Roker Park will be 9pm. There will be a whole host of sparkling features with family favourites pirates, dinosaurs and fairies, magically mixing with new Disney additions that will surprise and delight. A new art zone will include a series of artist-designed light artworks. The park will also be home to a food court and bar area, helter skelter and regular music and entertainment performances on the bandstand. Entry into Roker Park will cost £1 per person bought in advance online, £2 on the day from kiosks. Children aged two and under go free. Sunderland Illuminations 2017 come to an end in spectacular style with a firework extravaganza on Sunday 5th November at 6pm. Best viewing points will be from Cliffe Park and all along the seafront. There is no charge for this event and tickets are not required. To reach Sunderland Illuminations from our bed and breakfast accommodation simply drive South along the A183 coast road towards Sunderland. The Illuminated Observation Wheel is located on Cliffe Park, SR6 9NS and operates from 5pm until 10pm every night. The cost to ride on the wheel is £4 for adults and £3 for children. A family ticket for two adults and two children or one adult and three children is £10. Sunderland’s fourth restaurant week takes place from Saturday 9th September until Sunday 17th September 2017. Barnett’s Restaurant, 24 Frederick Street, Sunderland, SR1 1LT. Tucked away in a basement on Frederick St, Barnett’s Restaurant serves everything from a la carte dishes to proper home-cooked Sunday lunch, and remains a firm favourite for contemporary British cuisine in the city. Café Purple, Park Lane, Sunderland, SR1 3HY. Cross the Atlantic without leaving Sunderland, with a menu packed with wings, dogs, ribs, and burgers at this Park Lane haunt. Or, if you’re up for it, take a journey further South with the café’s crispy Texan and Tennessee chicken and pulled meat mounds. Crumb On In, 8-10 Holmeside, Sunderland, SR1 3JE. Located inside the Home Interiors shop at Holmeside, Crumb On In is a fab place to meet up with friends for a light lunch or a slice of something nice. Sunderland Restaurant Week offer: any toastie, cake and beverage for £5. DÕner Haus, 116 High Street West, Sunderland, SR1 1TX. Sunderland’s only Berlin kebap and Bier Haus. Sunderland Restaurant Week offer: kepab from ‘Berlin Doner Kebap’ or ‘Chicken Kebap’ section with a portion of skin on fries and a refillable soft drink for £10. Grand Didyma, 18A John Street, Sunderland, SR1 1HT. Enjoy the taste of Turkey in the heart of Sunderland at Grand Didyma. Located at John Street, the recently opened restaurant offers mouth-watering Turkish cuisine, traditional Meze dishes and meat served fresh from its charcoal grill. Marcellos4 Albion Place, Sunderland, SR1 3NG. A family owned and operated Italian restaurant located in the heart of Sunderland. Sunderland Restaurant Week offer:two courses for £10. Papas Tapas, Upstairs At The Isis, 26 Silksworth Row, Sunderland, SR1 3QJ. Ever had tapas and thought it was lovely but it still left you feeling hungry? Well that won’t be a problem at Papa’s Tapas, based above The Ship Isis. With all you can eat Spanish and English tapas, freshly cooked to order, it is the only restaurant of its kind in the city centre. Sunderland Restaurant Week offer: any three tapas, chips and a glass of house wine or soft drink for £10; all you can eat tapas for £15. Riverview Brasserie at The Stadium of Light, Stadium of Light, Sunderland, SR5 1SU. Sunderland Restaurant Week offer: Sunday lunch two courses for £10; Sunday lunch three courses for £15. San Marino, 141 Chester Road, Sunderland, SR4 7HD. San Marino is a classic Italian restaurant suitable for all occasions offering a excellent choice of dishes. Santinos, 5 Queens Parade, Sunderland, SR6 8DA. Classic Italian restaurant serving the best meals, cocktails and ice cream down on Seaburn’s Queens Parade. Saucy Burger, 10 Hylton Retail Park, Sunderland, SR5 3XG. Saucy Burger boasts a beefy line-up of mouth-watering burgers, topped with anything and everything you could want, from fried eggs and hash browns to honey nut cheerios and Monster Munch. Serendipity Tea and Trinkets, 10 Frederick Street, Sunderland, SR1 1NA. Fabulous homemade food, afternoon tea, vintage style tea room, gift shop and take away deli. Sunderland Restaurant Week offer: pot of speciality tea and cake of your choice, plus a bag of tea to take away for £5. The Chop House, 9 High Street West, Sunderland, SR1. Sitting above The Dun Cow, new kid on the block – The Chop House, is the place to go for quality meat and comfort food, washed down with fine wine, spirits and good ales. The Stumble Inn, 88 Chester Road, Sunderland, SR2 7PR. The Stumble Inn pub & restaurant offers a great selection of drinks & food with regular offers, live sports and live music. Sunderland Restaurant Week offer: selected main meals for £5. The Tipsy Cow, 32 Bridge Street, Sunderland, SR1 1TQ. Based at Bridge Street where historic Sunderland pub City Tavern once was, The Tipsy Cow was re-opened in 2016 with a fresh new look. The bar’s ale farm theme was what influenced the name and the food which includes burgers.mixed grills and full English breakfasts, is ideal to pair with a pint of the bar’s very own real ale. Sunderland Restaurant Week offer: two courses for £10 (main meal and dessert).